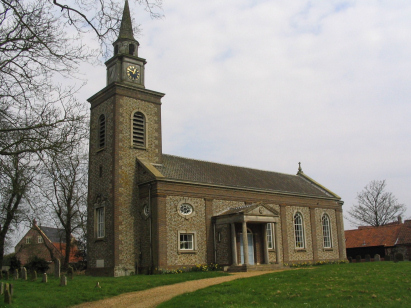 The parish of Bawdeswell lies adjacent to the A1067 Norwich to Fakenham road, now bypassed by the main road it is a quiet village with most of the houses clustered along the curving former line of the main road or the B1145 from Reepham to North Elmham which crosses the main road in the village. The straightness of the two respective roads gives a few clues to its ancient origins at the junction of two of the major Roman roads in the county. Nowadays it's a pleasant village with most of its facilities intact. All Saints church is a complete re-build from the Victorian era which was substantially updated in the 1950s in a Georgian style. 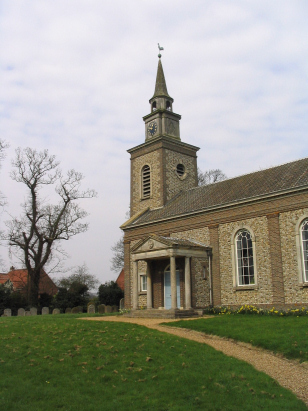 The original church was completely replaced by the more modern structure which is not without merits but rather atypical for a Norfolk church. This transcript was prepared from two sources, the deposited 800 entry register covering 1813 to 1872 which is filmed on microfiche 8 & 9 in the collection of the Norfolk Record Office. The later register still remains with the church but fortunately is duplicated by Bishop's tRanscripts enabling a complete transcript to be made. The microfiche are rather elderly and lack the clarity of modern images, however despite the usual hand-writing difficulties this was not a difficult transcript. The BTs were in surprisingly good condition and were of a similar standard to the fiche of the regular register. It is to be hoped that few errors will have crept into the compilation of this transcript.